We arrived at HNL airport a couple hours early and headed over to the IASS Hawaii Lounge, which is located on the ground floor past the Japanese garden. Despite having access for my entire family of 6 via my Lounge Club membership, something was lost in translation with the two lounge dragons guarding the front door who didn’t speak a word of English. Long story short, after 5 minutes of arguing and arm-waiving, we decided to just leave and kill time by shopping the post-Christmas sales. Our plane was waiting for us at the gate as we walked over, and I gave myself a pat-on-the-back as my choice of flying to San Jose airport (SJC) was further validated by the fact that the SFO-bound flights were all slightly delayed due to weather. I guess that I take for granted how easy it is to fly to Hawaii from the West Coast – our eastbound flight would take just over 4 hours, and I had upgraded the entire family of 6 into First Class using my Gold Guest Upgrades. While the First Class seats are very comfortable for lounging, I have to say that the legroom is actually a bit crammed, especially with a bag in front of you. A bottle of water and bag of snack mix were waiting for us, which we inhaled since we hadn’t stopped for lunch. As promised in the Alaska Beyond brochure, the power ports at each seat worked without a hitch throughout the flight. First Class passengers receive complimentary use of the digi-players which are pre-loaded with plenty of content. In addition, the Alaska Beyond streaming entertainment system worked pretty seamlessly throughout the flight, with just a few instances where the buffering took a minute or two to catch up. There wasn’t anything of interest to me, so I kicked back and finished the last few episodes of Serial. Shortly after take-off, menu’s were distributed. 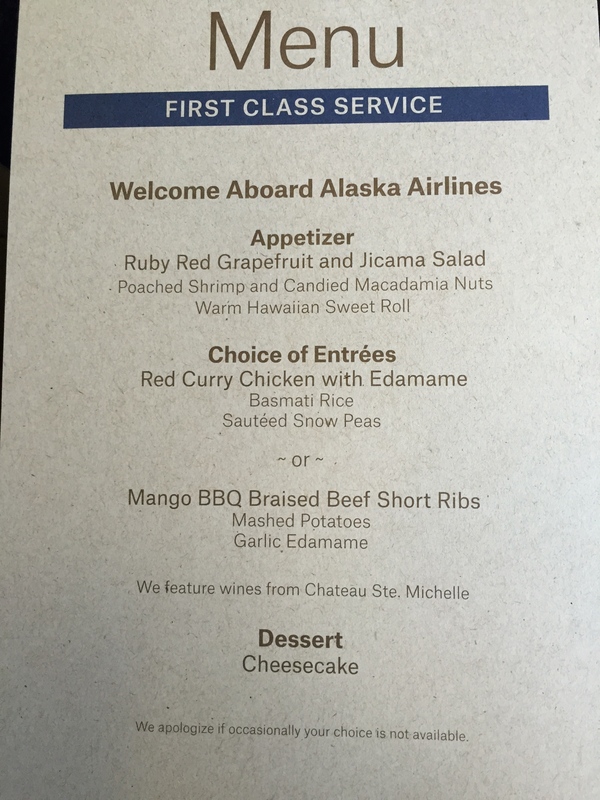 The flight attendant warned the passengers in rows 3 and 4 that our first choices might not be available, since they had loaded exactly 8 of each entree for the 16 First Class passengers. Having consumed way too much beef the day before at Korean BBQ, I was happy to let the others order the short ribs, and opted instead for the chicken. The meal started with a shrimp and jicama salad appetizer, which I washed down with a few cups of POG (passion, orange, guava) juice. The chicken was delicious, and I stole a bite of my mom’s short ribs for comparison. I definitely made the right choice. After meal service we only had a couple hours of flight time left, and the flight attendants were really great about making the drink rounds every 15-20 minutes. In fact, the service was so incredibly good that my parents took note, and will be switching over from United next year. This was my final flight of the year to put me over the hump for retaining my elite status with Alaska, and at this point I just can’t see myself leaving the program. I just love them and I love my MVP gold status. So much so that there are times that I think, well if Alaska doesn’t fly there, then perhaps there is a reason I shouldn’t go. Hey great post! I hope it’s alright that I shared it on my FB, if not, no problem just tell me and I’ll delete it.